It’s the last day of the year, and time for the obligatory look back at 2014. According to Goodreads, I have read 213 books this year. Pretty happy with that number, I have to say. I didn’t do so well with keeping on top of 2014 publications (apart from awards entries), and I also didn’t do so well at reducing Mount To-be-Read, since I probably bought more books that I read. Oops. I make no secret of that fact that I adore McDermott’s work, and I think that Perfections is some of her best writing. I was on the Aurealis judging panel which awarded the book with Best Horror Novel when it was released as an ebook only by Xoum, and I was so happy when Twelfth Planet Press issued a gorgeous paperback. Technically this was a reread for me, since I didn’t get to review it during awards judging, but I’m including it here anyway. I reviewed it as part of the Australian Women Writers’ Challenge (review here). It’s dark, but I’d recommend it to anyone, even those who usually don’t read dark fiction or horror. 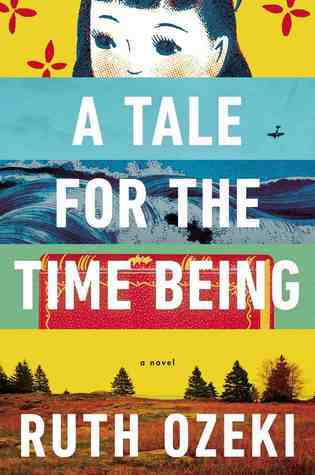 A Tale for the Time Being by Ruth Ozeki. Read as part of reading along with the books reviewed on the podcast by Kirstyn McDermott and Ian Mond, The Writer and the Critic. This is the first Ozeki I have read, and I seriously want to devour everything she’s ever written. The writing was incredible, and even months after finishing the book, the story haunts me. Ancillary Justice by Anne Leckie. It won lots of awards. It deserved to win lots of awards. It made me want to read and write more science fiction. I am looking forward to rereading this so I can read the sequel (which is sitting on Mount To-Be-Read). Haven’t read this? Please do so. Right now. If someone gave me money and time, I would so follow MacFarlane’s footsteps through most of these places. Someone give me a ticket to the UK right now please? The Memory Garden by Mary Rickert. I think I picked this one up after hearing it discussed on the Coode Street Podcast. And it’s just a gorgeous, magical book. One whose prose makes me ache to be even half as good a writer. It went straight to my favourites shelf. I read this initially via an eARC received from Netgalley, but went out and ordered a hard copy soon after. I rarely read epic or high fantasy these days, mostly because I’m burned out on seeing the same damn story over and over. This is not the same damn story. Nowhere near it. I am so looking forward to the next books in the trilogy. 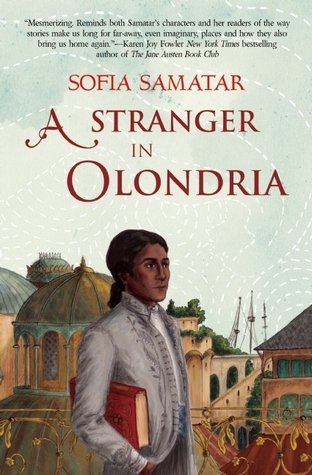 A Stranger in Olondria by Sofia Samatar. Like a feverish dream, with prose so beautiful that it feels at times as though you are listening to a poem or a song. This debut novel by Samatar has made me a life-long fan, and I will read everything she ever writes. 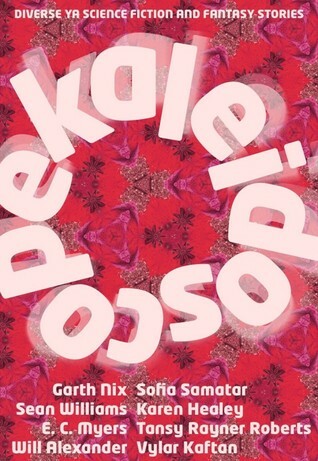 Kaleidoscope, edited by Alisa Krasnostein and Julia Rios. Several of the stories in this anthology are entrants in the Aurealis Awards YA Panel, of which I am a judge. This is my anthology of the year (with Long Hidden as a close runner-up). So many good stories, but I have to especially mention Sofia Samatar’s Walkdog, which is absolutely incredible. There are quite a few more books that I have five and four star reviews to on Goodreads, and I could really make this list at least twice as long. If you’re keen on looking at what else I read in 2014, you can have a look at my Goodreads shelf for 2014. Next year I really want to make more of an inroads into my to-be-read mountain, as well as do some serious culling of my shelves. Seriously, I ran out of shelf space a long time ago, and there are books in stacks kind of everywhere. Plus, I can’t find anything right now. I don’t think I can convince anyone to install compactus shelving in the house, so a cull is the only answer. This year for the Australian Women Writers’ Challenge I signed up at the Franklin level – read at least 10 books, reviewing at least 6. Female Australian authors read: 52. The Interrogation of Ashala Wolf by Ambelin Kwaymullina. The Other Tree by D.K. Mok. Peacemaker by Marianne de Pierres. The Swan Book by Alexis Wright. The Secret River by Kate Grenville. Overall, I’m really happy with my reading year in terms of this challenge. The total number of books was easy to achieve, since I was judging for the Aurealis Awards both at the beginning and end of the year. I had originally set up a mental challenge to myself to review at least one book a month, but that unfortunately fell by the wayside. I feel fairly happy with the seven reviews I got written, though. I’m especially glad that I picked up more books by Indigenous writers this year, and hope to extend that into my challenge for next year as well. Of particular note is Mullumbimby, which I picked up specifically because it was linked from the AWW Goodreads page, and was probably a book that I wouldn’t have normally come across otherwise. Many thanks to the organisers of the challenge, and if you’ve never given it a go, I encourage everyone to. Even if it makes you pick up one book by a female Australian author, I consider that a worthy accomplishment. A darkly funny novel of romantic love and cultural warfare from one of Australia’s most admired Indigenous voices. When Jo Breen uses her divorce settlement to buy a neglected property in the Byron Bay hinterland, she is hoping for a tree change, and a blossoming connection to the land of her Aboriginal ancestors. What she discovers instead is sharp dissent from her teenage daughter, trouble brewing from unimpressed white neighbours and a looming Native Title war between the local Bundjalung families. When Jo unexpectedly finds love on one side of the Native Title divide she quickly learns that living on country is only part of the recipe for the Good Life. I’m not going to put anyone in suspense here. I loved this book. No, I loved this book. One of the things I’ve tried to do with my reading for the Australian Women Writers’ Challenge is to expand beyond the normal limits of my reading – which, for me, means picking up more non-speculative work, and especially trying to pick up works by Indigenous authors. Side note: I’m finding myself staring at the cover of Mullumbimby as I’m typing this. The image of a bird’s nest woven from barbed wire, but lined with soft feathers and leaves for the baby birds, is one of the strongest in the book. For me, that single image sums up many of the themes in the book: Jo’s personal struggles as she fights to make her place on her own piece of land, her relationship with her daughter and with the man who comes into her life, Twoboy, and the greater battle Indigenous Australians fight for Native Title, the rights to the land that they believe is theirs by right and that was stolen from them. Jo Breen is an incredible character. From the moment she steps foot onto the page she is living and breathing as she fights to establish her farm. Her love for the land, her daughter and her horses is so incredibly strong, aptly mirroring the strong ties that many Indigenous Australians feel to their native land. Some reviewers have complained about the choice Lucashenko made to incorporate Bundjalung dialect into the book, but I felt that it served to give the story even more power. A glossary is provided at the back of the book for those who need it, but I found that Lucashenko’s writing was almost always good enough to divine the meanings of words unknown to me simply by their context. It’s possible that non-Australian writers may struggle slightly more with this, since both landscape and language could potentially both be unfamiliar. In particular, I believe that the use of dialect highlighted the fact that I, as a white Australian reader, was oftentimes being given a look into a world that both was and was not mine. There are many extraordinarily powerful moments in this book. Jo as she works to maintain the cemetary, even as she returns exhausted from that work to wrestle returning her own land to health. The aforementioned bird’s nest, and the things that Jo experiences in the bush, evidence of the ancient spiritual connections of her bloodline to the land. All of this works to highlight some of the separation that Jo feels to her own past, which mirrors the breaking of much of Indigenous Australia with the land. There is heartbreak, and there is struggle and loss as Jo fights for her place in the world. But at the end, Mullumbimby also gives much hope. Lucashenko should be commended for the sensitive manner in which she deals with major issues relating to Indigenous Australia. This is a book that I highly, highly recommend to anyone living within Australia, or with a desire to learn more about this country.